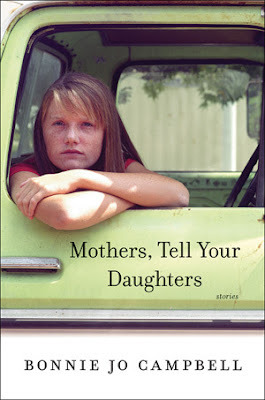 Bonnie Jo Campbell, an award-wining American author, has penned a book of short stories, Mothers, Tell Your Daughters, that unfolds the stories of some hard-working middle-class some abused and some vulnerable women in Kalamazoo, Michigan. Each and every story has a female protagonist who narrates an unusually raw and shamefully honest story about their lives that questions our male dominated society. From the National Book Award finalist and author of Once Upon a River comes a dazzling story collection featuring ferocious mothers and scrappy daughters. The strong but flawed women of Mothers, Tell Your Daughters love and betray one another; their richly fraught relationships can act as anchors, lifelines, or deadly poison. Bonnie Jo Campbell’s working-class protagonists are at once vulnerable, wise, cruel, and funny, and they are always getting into or out of trouble. In “My Dog Roscoe,” a new bride becomes obsessed with the notion that her dead ex-boyfriend has returned to her in the form of a mongrel. In “Blood Work, 1999,” a phlebotomist’s desire to give away everything to the needy awakens her own sensuality. In “Home to Die,” an abused woman takes revenge on her bedridden husband. In these fearless and darkly funny tales about women and those they love, Campbell has created characters that will capture the hearts and minds of her readers. From the title of the book, Mothers, Tell Your Daughters it feels like the author has explored the mother-daughter relationships, but once you start reading, you will realize that the author has tried (and has been successful at it!) to portray and vividly capture the real-life stories of women of a certain age who have suffered enough to find a way towards survival. I will urge every women to read this masterpiece so as to get an idea of what it feels liked to be thrown away like some piece of trash or to feel what these already struggling women have dealt with in their lifetime. In the title story, the author captures the intense first person narrative of a mother to her adult daughter who blames her abuse from her mother's changing boyfriends. She speaks from her deathbed, as she is suffering from lung cancer, about her experiences with so many various men over the years who have either raped her or assaulted her. And she is terrified about one of her ex-boyfriend's abuse of her daughter. The writing style of the author is emphatic as the message is loud and clear to the readers that it is not easy to escape the darkness and the evil in a society for a woman of limited means. Each and every stories are thoroughly heart-breaking and are bound to leave a lasting expression into the minds of the readers. The narrative of the stories are articulate and absolutely honest that makes the stories even more striking. The evocative prose of each and every story will leave the readers with a sense of sadness and longing for the victimized protagonists. The stories even reflects the double standards of a male-entitled society with the troubles of these women who have attained at a certain level where they could voice their grief. Overall, this was an unique read for me and I, as a woman, felt ashamed as well as angry for the lives of these women. This is a highly captivating and enlightening and genuine book that is a must read for each and every women, be it a 16 years old or a 50 years old lady. Verdict: Books like these should be forever treasured by each and everyone. Courtesy: Thanks to the author, Bonnie Jo Campbell, for giving me an opportunity to read and review her book. Bonnie Jo Campbell is the author of the National Book Award finalist American Salvage, Women & Other Animals, and the novels Q Road and Once Upon a River. She is the winner of a Pushcart Prize, the AWP Award for Short Fiction, and Southern Review’s 2008 Eudora Welty Prize for “The Inventor, 1972,” which is included in American Salvage. Her work has appeared in Southern Review, Kenyon Review, and Ontario Review. She lives in Kalamazoo, Michigan, where she studies kobudo, the art of Okinawan weapons, and hangs out with her two donkeys, Jack and Don Quixote.